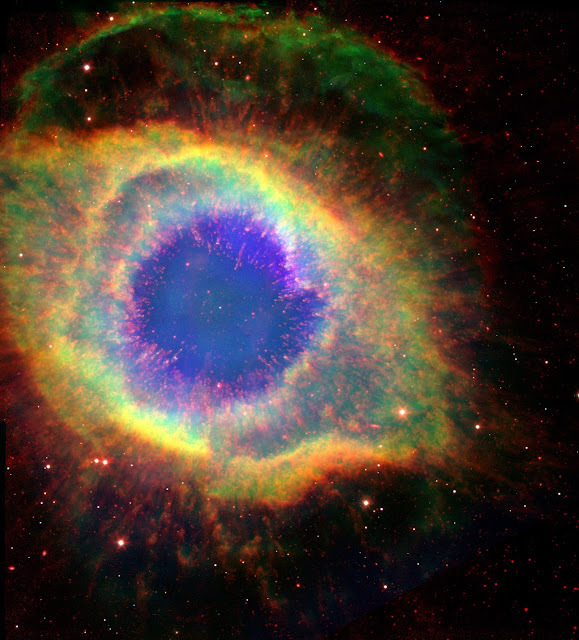 Named for its resemblance to a coiling spiral seen face on, the Helix Nebula (NGC 7293) is a challenging stargazing target that has a more complex three-dimensional structure than expected. Now, the nebula has a new portrait, created by the penetrating infrared gaze of NASA's Spitzer Space Telescope, which was released at the 207th meeting of the American Astronomical Society on Jan. 9, 2006. The nebula, which is composed of gaseous shells and disks puffed out by a dying sunlike star, exhibits complex structure on even the smallest visible scales. This image is a composite of infrared data from Spitzer and visible-light data from NASA's Hubble Space Telescope.